RPG Maker allows you to offer your players choice selection, and depending on which choice they pick, your events will behave differently. However, what happens if you wanted to have a particular choice display a different text, depending on whether certain conditions have been met? Maybe if you haven’t found an item that allows you to understand what the locals are saying in a foreign language, all of the text that is shown will be garbled. In particular, if you combine it with a plugin that allows you to disable choices, you could show question marks instead of the actual text. With this plugin, you can easily change a choice’s text using events. Some other plugins that you might be interested in! Download the plugin and place it in the “plugins” folder in your project’s “js” folder. 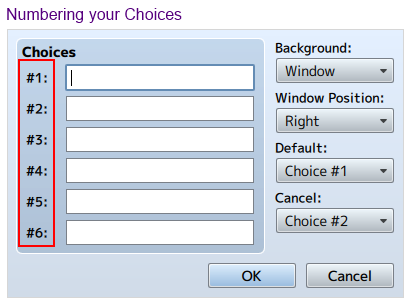 Then open your Plugin Manager (F10), double-click an empty row, and select the ConditionalChoiceText plugin. Take a look at the image above. The numbers along the left is how choices are numbered. You will use these numbers when changing a choice’s text. There are two ways to change a choice’s text. Where the `choiceNumber` is the number of the choice that the text will apply to, and `customText` is the text that you want to change to. You can include spaces in your text. It is up to you to set up the conditional branches appropriately. Where the `choiceNumber` is the number of the choice that the text will apply to, and `customText` is the text that you want to change to. The `condition` is a valid formula that evaluates to true or false. The specified choice’s text will only be changed if the condition is true.